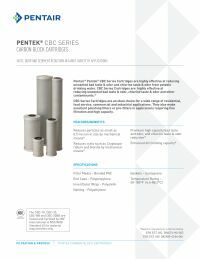 The Pentek CBC-5 carbon block cartridge is highly effective at reducing chlorine taste and odor from potable drinking water. The unique structure of the carbon block enables it to reduce giardia, cryptosporidium and other cysts and fine sediment particles down to 0.5 microns. The CBC-5 is manufactured entirely from FDA-compliant materials and make excellent polishing filters or pre-filters in applications requiring fine filtration and high capacity.